I’m in love with this recipe. It’s one of my favorite fish tacos ever! Probably because it contains many of my favorite ingredients….avocado, mango, lime juice, and a touch of chipotle pepper flavor. It’s easy to prepare and can be adapted to your own taste. I used tilapia but other fish may be substituted according to your own taste. The fish is marinated quickly in oil, salt, and pepper and is served on top of a lime-flavored vegetable slaw and drizzled with a chipolte flavored sour cream. The recipe, adapted from Giada, originally called for arugula (I substituted pre-shredded cabbage) in the slaw and wasabi powder to season the sour cream (I used chipotle chili powder). Although I love arugula sometimes it’s just a bit too bitter. I’m not quite sure if that’s caused by differing varieties or if it’s due to something else? For the sauce, I tried the wasabi powder (a flavor that I normally love), but I felt it was also too bitter, and I highly prefer the smokiness that the chipolte powder imparts. These tacos can be served on either flour tortillas or corn tortillas (I favor the former, but another goal of mine is to make homemade corn tortillas, so I may change my mind!) I served the vegetable slaw on the side (also used inside the taco), but a black bean salad would also serve as a nice side dish. 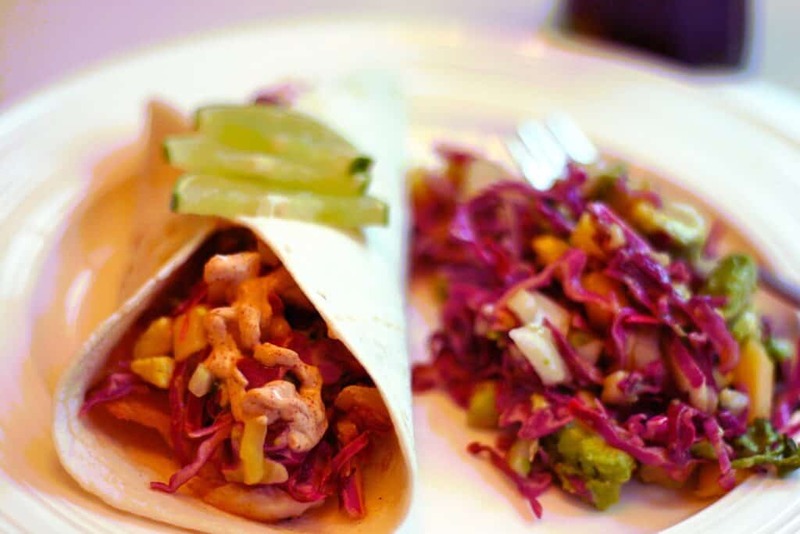 Prepare the slaw dressing by combining 2 tablespoons of olive oil, 1 tablespoon of lime juice, and 1/4 teaspoon of salt. Whisk the dressing and drizzle it over the slaw mixture. Set aside. Prepare the chipotle sour cream by adding 1 teaspoon of chipotle chili powder and 1/4 teaspoon of salt to 1 cup of sour cream and mixing well. Just before serving, grill the fish for approximately 2 to 3 minutes per side. 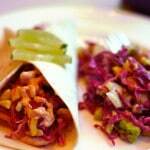 To serve, layer each tortilla with slaw, followed by fish, and then top with drizzled chipotle cream.